Dorothy Wong with her University of Virginia doctoral student, who spent the summer of 2017 at ICU. 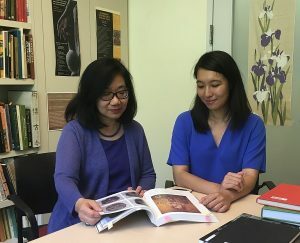 Dorothy Wong firmly believes that the study of the humanities has great value, even as policy discussions in Asian and American contexts focus on building up STEM-related fields. 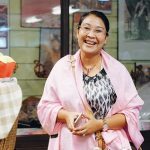 “We need to recognize how important it is to think critically,” she said, and in her view, the study of subjects such as philosophy, art, music, and literature can develop that ability and promote a greater sense of social responsibility. 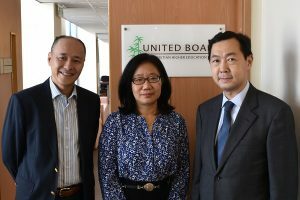 Dr. Wong at the United Board’s Hong Kong office, with Executive Vice President Ricky Cheng, and Tommy Cho, ICU Class of 1982. Dr. Wong’s field of expertise is the Buddhist art of medieval China, yet she makes a strong case for students in all fields to incorporate the humanities into their university education. 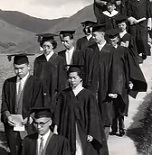 “People talk about the job market,” she said, and assume that business, engineering, science, or computer courses offer the surest paths to employment. But more ambitious students – and their parents – should take a broader view if they want to reach the top of their respective fields. “In high-level positions, you need people who can make an argument, see multiple perspectives, write well, and be articulate,” she argued. “These skills don’t come from technical classes but from the humanities, where you learn to think in a logical and sophisticated manner, to identify subtle differences, and to read and interpret critically.” She hopes students will recognize that achievements in science or medicine can go hand in hand with the humanities, and that pursuing a double major or adding a minor in the humanities can strengthen long-term career prospects. Dr. Wong is thankful for the liberal arts education she received at ICU and her scholarship from the United Board. She expresses her gratitude through her contributions to the United Board in support of faculty development and peace studies. “ICU’s founders believed respect for other cultures would lead to peace,” she said, and she encourages students to seize opportunities, as she did, for international exchange and the possibilities it creates for greater understanding of people, cultures, and ideas. The United Board is grateful to Dr. Wong for her support of its programs and for her planned gift commitment through the United Board Legacy Society.